The outlook for the right to use marijuana is bright, as the majority of both Republicans and Democrats support legalization. Traditionally, Democrats have been associated with fighting for legal marijuana, but even red states are jumping on board. For example, red-state Oklahoma recently voted for the legalization of medical marijuana, making it the 30th U.S. state where medical cannabis is legal. Americans are discovering the benefits of medical marijuana as a treatment for a range of health conditions and see no reason for punishing those who use marijuana. With the 2020 elections coming into view, both Democrats and Republicans need to consider how the promise of marijuana legalization will influence voters, especially if politicians wish to appeal to younger voters. According to the Pew Research Center, 70 percent of millennials support the legalization of marijuana. So, where do both parties stand and which 2020 presidential candidates are pro-cannabis? In this article, we will explore marijuana politics and the possibility of legalization in the next few years. As you will see, most Americans would have no issue with a pro-cannabis president, and Republicans and Democrats might use marijuana legalization to win votes. According to the Drug Policy Alliance, 653,249 people were arrested for a marijuana law violation in America in 2016. Of those, 89 percent were arrested for possessing marijuana only. A criminal conviction changes a person’s life because it affects employment and financial assistance eligibility. For example, over 200,000 students lost federal financial aid eligibility due to a drug conviction. Once a person is charged with a drug crime, they must carry that burden for the rest of their life unless they qualify for expungement. For many Americans, marijuana laws do not make much sense. Considering that alcohol is legal and kills an estimated 88,000 people a year, it does not seem fair to prosecute individuals for using weed which has never caused an overdose death. Unlike alcohol, marijuana helps ease pain and nausea for many Americans with debilitating conditions like cancer or multiple sclerosis. For some Americans, marijuana has helped them overcome opioid addiction. In October 2017, the Pew Research Center found that 61 percent of Americans say the use of marijuana should be legalized. According to a CBS News poll from April 2018, 59 percent of Americans think marijuana should be legal, and 63 percent believe cannabis is less harmful than other drugs. A 2018 Quinnipiac University poll found that 63 percent of Americans support legalizing marijuana and 93 percent support the use of medical marijuana. America’s view of marijuana has evolved drastically over the years as only 31 percent of Americans supported marijuana legalization in 2000. Now, with medical marijuana legal in 30 states, and recreational use legal in nine states, the topic is a popular source for debate. Politicians on both sides are coming out to support legalization and win over Americans, and politicians almost need to get on board to gain support from the majority. Expect marijuana legalization to be a hot topic in the 2020 elections. If you want to support the legalization of marijuana during the next presidential election, know that your vote makes a difference. America’s voting system can be confusing, but it should not discourage voters from taking a stand. Here is a simple breakdown of how things work. The election for the president happens every four years on the first Tuesday after the first Monday in November. The next election is set for November 3, 2020. The process begins with the primary election, and each party selects a nominee to make it to the next level. The general election is when the American public casts their vote for who they think should be president. These votes are known as the popular vote. The popular vote does not determine the president. Instead, your vote helps determine who will vote in the Electoral College. The Electoral College is a group of people who choose the president. For example, if the majority of voters in your state votes for a Republican presidential candidate, then Republican “electors” will be chosen to vote in the Electoral College. It is most likely they will vote for the same presidential candidate as the majority in the state. However, they are not required to vote according to the popular votes they represent. That is why is possible, but uncommon, to lose the popular vote but win the Electoral College. To win the election, the candidate must win the majority of electoral votes. In some states, votes could easily go either way because there is significant support from both sides. These states are called swing states. In a swing state, an issue like marijuana legalization could be the factor that determines whether voters lean Republican or Democrat. Candidates fiercely compete to win over swing states, and marijuana legalization might be the tool they use to get ahead in 2020. Marijuana was not always prohibited. However, throughout the 20th and 21st centuries, lawmakers cracked down on marijuana use and possession. Republicans have been traditionally more strict with marijuana laws than Democrats. However, times are changing. Let’s look at where Democrats and Republicans stand now, and how both parties support legalization more than ever before. Hillary Clinton, a Democrat nominee in the 2016 elections, said the federal government should allow states to legalize marijuana, but she did not call for marijuana to be removed from the controlled substances list. Clinton believes in acquiring more evidence about the effects of marijuana before making big changes. Sixty-nine percent of Democrats say marijuana should be legal according to the Pew Research Center poll from 2017. So far, twelve Democrats have cosponsored the bill while no Republicans have signed on yet. Other experts believe that cannabis legalization, although a popular topic, is not enough to win an election. However, it could certainly influence voter decisions. Marijuana did not present any legal issues until the 1930s. In 1937, the “Marihuana Tax Act” was passed as a federal law placing a tax on the sale of cannabis products. It did not arrest people for smoking marijuana. However, it did warrant jail time if taxes for possessing the drug were not paid. The Boggs Act of 1952 and the Narcotics Control Act of 1956 gave two to 10 years of jail time for possession of marijuana and a fine of up to $20,000. However, in 1970, Congress repealed most of the mandatory penalties for drug-related offenses believing them to be too harsh, and marijuana was recategorized as separate from other narcotics. In the 1980s, President Ronald Reagan broadened and enforced many of Nixon’s policies, developing the “just say no” campaign. His focus led to a rise in drug-related incarceration. In 1989, President George Bush declared a new War on Drugs in a national speech. Times have changed since Nixon’s War on Drugs. According to the Pew Research Center poll, 43 percent of Republicans say marijuana should be legal. A Gallup poll found 51 percent of Republicans support legalization — the first time the majority of Republicans support legalization. Republican Beto O’Rourke of Texas is looking to make legalization of marijuana part of his campaign for Senate. U.S. House Representative and Republican Dana Rohrabacher of California introduced a bill which has 39 cosponsors, including Republicans, to prevent prosecution of businesses and consumers who follow state marijuana laws, but he does not support legalization on a federal level. At this point, it would be a mistake for Republicans to support stricter marijuana laws. Some states, like Texas, might be slower at moving towards legalization, but even their attitudes are changing. Sixty-nine percent of Texans would support a reduced penalty for small amounts of pot. Attorney General Jeff Sessions, a Republican, made a mistake when he revoked the Cole Memorandum, which limited federal enforcement of marijuana laws in states where is it legal. Democrats used his move to gain support for legalization, highlighting the importance of medical marijuana as a medicine for many families. Democrats also stress how Sessions could undo the hard work states have done to regulate marijuana and how his decision would waste funding on weed laws instead of more important issues. In response to Session’s move, Senator Cory Gardner, a Republican from Colorado, gave a speech saying that he believed what happened was a “trampling of Colorado’s rights and its voters.” If Sessions moved forward with prosecuting states where it is legal, Colorado would lose millions in tax revenue from the cannabis industry, and thousands of jobs would be at risk. This proves that Republicans are fighting for the legalization of marijuana against other Republicans if necessary. Although there is plenty of time before the next presidential election, here are possible pro-cannabis candidates you might see fighting for the win. New Jersey Senator Cory Booker, a Democrat, introduced the Marijuana Justice Act to Congress in 2017. The act would remove marijuana from the controlled substances list which would legalize it federally, leaving it up to each state to regulate marijuana. It would also help reverse the punishment placed on individuals convicted of marijuana-related drug crimes. Senator Booker believes marijuana should be legal, and he will likely be a candidate for the 2020 election. New York Senator and Democrat Kirsten Gillibrand cosponsors the Marijuana Justice Act with Cory Booker and wants to fight for those who have suffered as a result of the War on Drugs. In addition to supporting the legalization of weed, she strongly opposes the moves Jeff Sessions made to enforce marijuana laws. California Senator and Democrat Kamala Harris also cosponsored the Marijuana Justice Act in May of 2018, increasing the chances it will get passed. Harris said in an MSNBC interview that she is “not ruling it out” when asked about running for president in 2020. Senator Bernie Sanders, Democratic senator of Vermont, openly supports the legalization of marijuana for both recreational and medicinal purposes. He believes states have the right to regulate marijuana, and it should not be prohibited on a federal level. Senator Sanders feels individuals with drug addiction problems should be treated for their addiction rather than punished. Although Hillary Clinton beat Bernie Sanders in 2016, he might try again come 2020. A Morning Consult poll found that 75 percent of survey participants approved of Bernie Sanders, making him the most popular senator in the country. Democratic Senator Elizabeth Warren of Massachusetts may run in 2020. Warren supports legalized marijuana and fights for states who have already legalized it. She says that our federal marijuana laws are “outdated” and “broken.” She does not believe in forcing states to legalize marijuana, but she supports developing new federal guidelines to protect states rather than punish those where it is legal. In April, Warren told reporters that she did not plan to run for president in 2020. Perhaps she’ll change her mind before then. Connecticut Senator and Democrat Chris Murphy supports changing the federal classification of marijuana and believes that thousands of lives have changed for the better in Connecticut since medical marijuana had become legal in the state. Murphy may not be as popular as Bernie Sanders, but he is well-liked on Twitter and may reach young voters if he chooses to run in 2020. Fewer opiate-related deaths: A study from 2016 found that marijuana use was associated with 64 percent lower opioid use, in patients suffering from chronic pain. Over 100 Americans die every day from an opioid overdose. Effective treatment for patients: All across the country, individuals with severe health conditions would no longer have to fear legal consequences for taking marijuana medication to soothe a wide range of symptoms such as nausea, pain, inflammation and post-traumatic stress disorder (PTSD). More scientific research: If weed is legal on a federal level, scientists, doctors, and researchers may be less hesitant to study marijuana and its effects on the human body. Similarly, organizations might be less hesitant to fund medical marijuana studies. Research could lead to advancements and discoveries. A decrease in violent crime: A study published in 2017 found that medical marijuana laws lead to a decrease in violent crime in states that border Mexico, with the most crime reduction in those related to drug trafficking. They also found a decrease in crime in inland states that have medical marijuana laws. They concluded that the legalization of marijuana reduced violent crimes that are traditionally controlled by drug trafficking organizations. An economy boost: A data analytics firm called New Frontier Data predicts that legalizing marijuana would create at least $132 billion in tax revenue and over a million new jobs by 2025. Fewer non-violent offenders in jail: Harvard economist Jeffrey Miron predicts that legalizing marijuana would save the government $7.7 billion a year, partially in expenses to enforce the law. Taxpayers would save thousands not having to throw marijuana users in jail. Marijuana-related arrests cost the U.S. between $1 and $6 billion a year. Safer marijuana products for consumers: If marijuana is legal, consumers can purchase marijuana from a reputable dispensary. They can trust they are purchasing a safe product rather than acquiring cannabis from an unknown source illegally. They can ask questions at the dispensary and gain knowledge about the product so they can take marijuana with confidence. Legalizing marijuana does not mean that there will be no rules and everyone will walk around high. Depending on what happens in the future, chances are states will decide on regulations because rules are still needed to keep things under control. For example, although marijuana has many benefits as a medicine, it still would not be safe to allow citizens to drive while under the influence of marijuana. Certain laws need to be in place for the health and safety of the public. Every issue has its pros and cons, and the legalization of marijuana has been a topic of debate for a long time. 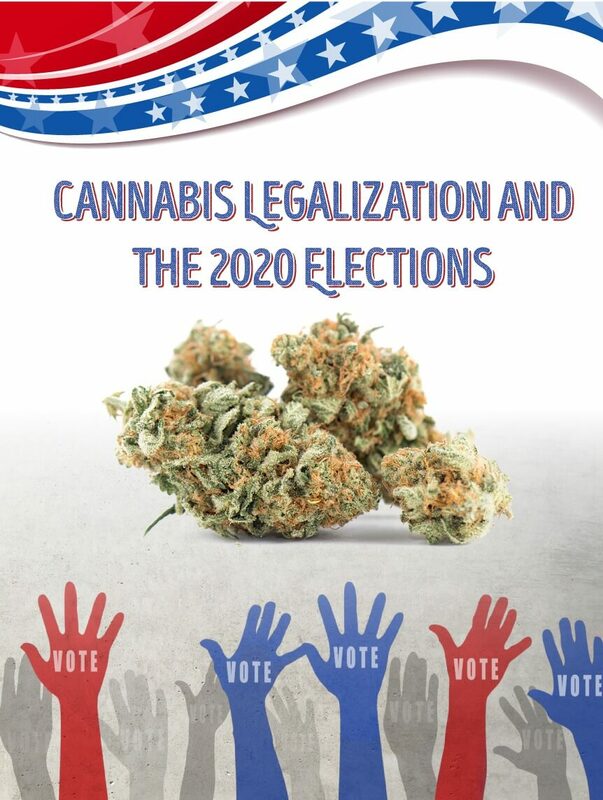 With the 2020 presidential elections on the horizon, it is likely that the legalization of marijuana will be a popular subject. As the research shows, the majority of Americans favor legalization of this healing plant. Possible candidates will consider how they can gain support by advocating legalization. Nevertheless, laws and viewpoints change every day, and it is hard to predict how things will turn out. Presently, it seems that the legalization of marijuana has a promising future. To stay informed about the latest marijuana politics and news, sign up for the free MarijuanaDoctors.com monthly newsletter today. Looking for a marijuana-certified doctor or a quality dispensary to meet your cannabis needs? Use our site to find the best doctor or dispensary near you.